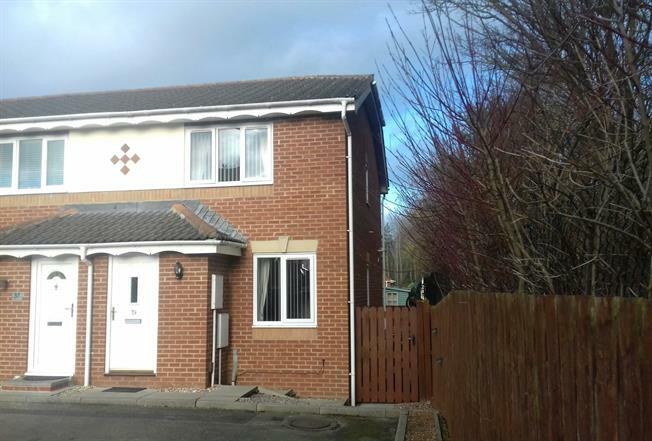 2 Bedroom End of Terrace House For Sale in Darlington for Offers in excess of £125,000. Situated in the sought after High Grange area of Darlington this two bedroom property is well presented and modernised through out. The property is excellently located for road transport links including the A1(M), Amenities included the recently built M&S food hall, Aldi and greater West Park development which includes a local primary school and pub. The property comprises in brief lounge, kitchen diner, two bedrooms, bathroom, rear garden, two parking bays, uPVC double glazing throughout and gas central heating. Situated to the front of the property this well presented room benefits from two windows and feature electric fire place. Well presented contemporary kitchen situated to the rear of the property which benefits from an array of wall, floor and drawer units. The kitchen has French doors which lead onto the rear decking. The kitchen comprises a modern Baxi combi boiler, gas hobs, oven, extractor fan, space for a washing machine and space for a fridge freezer. Situated to the front of the property this double bedroom benefits from a substantial mirrored storage unit. Modern bathroom with tiled walls, tiled floor, bath tub with shower over, low level WC, pedestal wash hand basin and chrome heated towel rail. Situated to the rear of the property this double bedroom benefits from two windows. To the rear of the property there is a decking area, lawn, summer house with electricity, additional storage shed, the property benefits from side access which is also useful for storage. To the front the property also benefits from space for parking two cars.